March was our busiest month yet at IVUmed – including five workshops across the globe! Our next few blog posts will highlight those trips with quotes from IVUmed volunteer medical providers and photographs from the regions served. IVUmed is currently conducting a female reconstructive urology workshop in Pignon, Haiti at the Hopital Bienfaisance de Pignon until March 27, followed by a male reconstructive urology workshop through April 5th. The Morrison County Record out of Minnesota interviewed Justin Lindhart, a CRNA volunteer on the female urology team, on his fifth medical service trip to Haiti. In his interview, Lindhardt shared details regarding his work with IVUmed and insights into providing medical training and care in Haiti, giving a perspective on the challenges and rewards of working in resource-poor areas around the world. 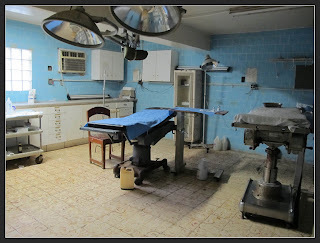 “The hospital at Pignon, in comparison to other third world countries, is outstanding. They have Stryker Endo Suites which means they have high definition monitors and video equipment. They are able to hook up by satellite to any hospital around the world to assist in teaching and learning from others. By using this equipment they are able to watch other procedures at other sites,” Lindhardt said. “In other years we had support in the form of supplies from St. Gabriel’s Hospital, Catholic Health Initiatives, and Little Falls Anesthesia which we were very thankful for. Now there is funding through IVUmed and others. They have everything we need ready for us when we get there,” he said. Our thanks to the Morrison County Record for covering this story, and to Justin Lindhardt and all of the many IVUmed volunteers who serve around the world to help realize IVUmed’s goal to make quality urological care available to all people. Read the original interview on The Morrison County Record website here. 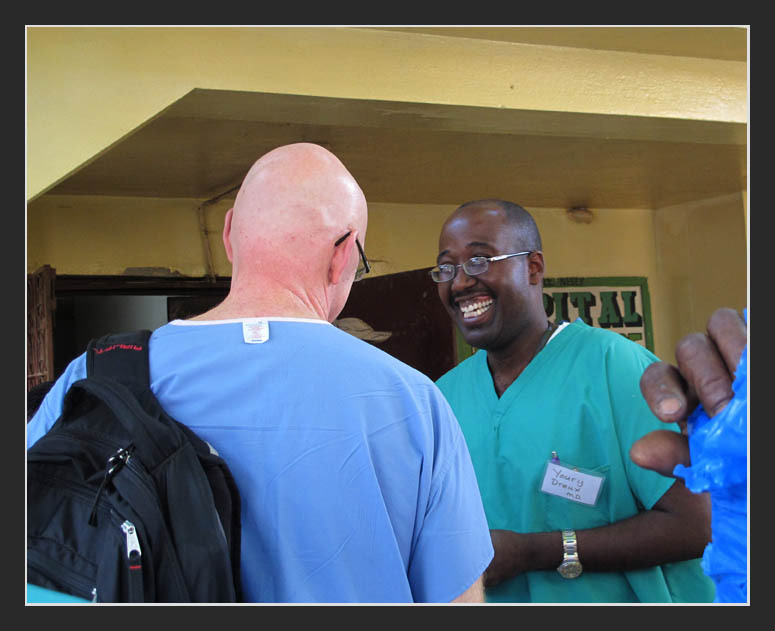 Dr. Robert Edelstein first traveled to Haiti for humanitarian service after the catastrophic 7.0 earthquake in 2010. However, his commitment to helping improve medical training and patient care in Haiti was not satisfied through a single visit. 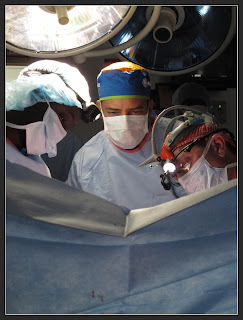 He has just returned from his fourth IVUmed surgical workshop in Deschapelles, Haiti, working with fellow IVUmed volunteers to build sustainable urology capacity there. 1. What has kept you inspired to volunteer in Haiti and work with IVUmed? I first went to Haiti after the earthquake in 2010, because I felt a very strong need to help out in any way that I could. I really didn’t know what to expect, but it ended up being a very productive trip. While there, I felt that I had to return. The need for urologic services in Haiti is profound, and the strength and resourcefulness of the Haitian people is very inspiring. I had always wanted to work with IVU due to its experience, urologic focus, and commitment to teaching, and I have been lucky enough to do so in the years since. 2. What have been the most challenging and most rewarding aspects of your IVUmed service so far? The most rewarding aspect to me is having the opportunity to work with Haitian health care professionals. The trip gives an excellent opportunity to learn from each other’s experiences. There are many challenges, of course, but finding solutions together can be a great part of the experience. 3. What insights can you share with other medical professionals considering working with IVUmed or other humanitarian organizations? The opportunity to serve outside of the United States is a uniquely challenging and deeply satisfying experience. Many of the things that we take for granted daily don’t exist in rural Haiti, and often new ways must be found to solve problems using the local resources. The depth of knowledge and resources that IVU has to work with is inspiring and reassuring on these trips. 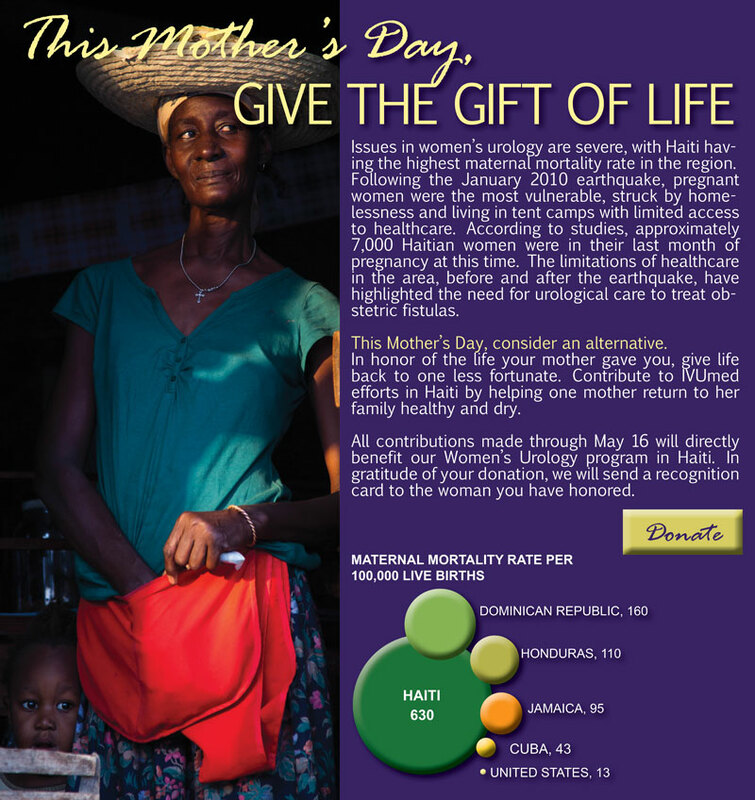 After the 2010 Haiti earthquake, there was an influx of medical volunteers and desire to help in such a traumatic event. While this displays admirable initiative, there are many factors that go into international medical volunteerism outside of the desire to do good work that require experience and understanding of local culture. In one study, co-authored by Richard Gosselin of UC Berkeley’s School of Public Health, almost two-thirds of the surgeons who volunteered in Haiti had no prior disaster experience. When a nation has declared a natural disaster, “disaster relief” is primarily in the first 24 to 72 hours following the event. In this situation, outside aid must be completely independent of local resources; providing their own medicines, staff, food, water, sometimes electricity and anything else needed to perform their role. The troubled area cannot be depended on or depleted of remaining resources when providing assistance. Many medical volunteers do not recognize or have the capacity to provide these resources when traveling to provide assistance; military and governmental organizations, primarily, are able to. As days, weeks and months go by, the focus is on humanitarian aid. Many organizations will have developed a base for care and semi-permanent facilities. At this point, medical volunteers are able to connect and work with a well-experienced and community-integrated group to efficiently provide care. 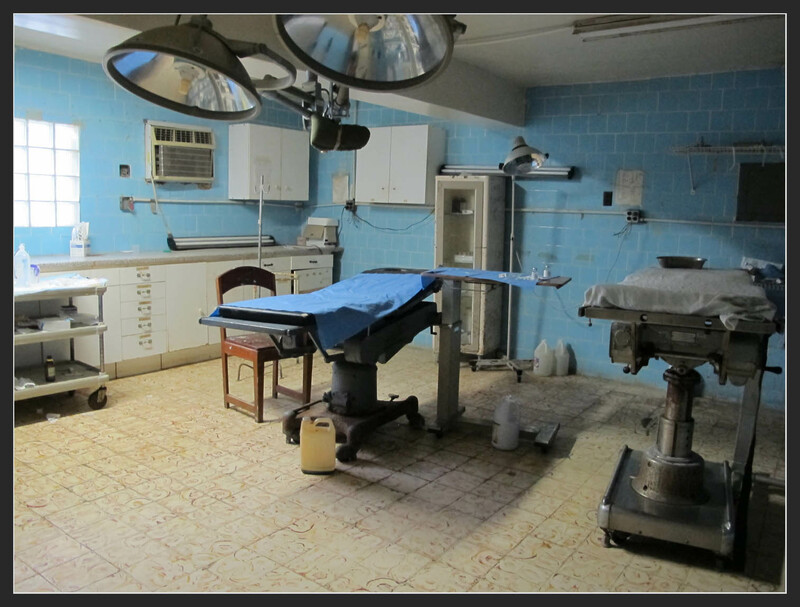 In this setting, doctors are able to use resources immediately available to them to perform surgery in a safe and effective way for the nation in need. When are we doing more harm than good? Is this the best use of our skills and time? How can we avoid recreating the wheel? What can I learn before going into a culture completely different from my own? Whether you are a community volunteer or a volunteer with a specific skill set, it is crucial to consider these questions when helping in disaster relief or humanitarian aid. 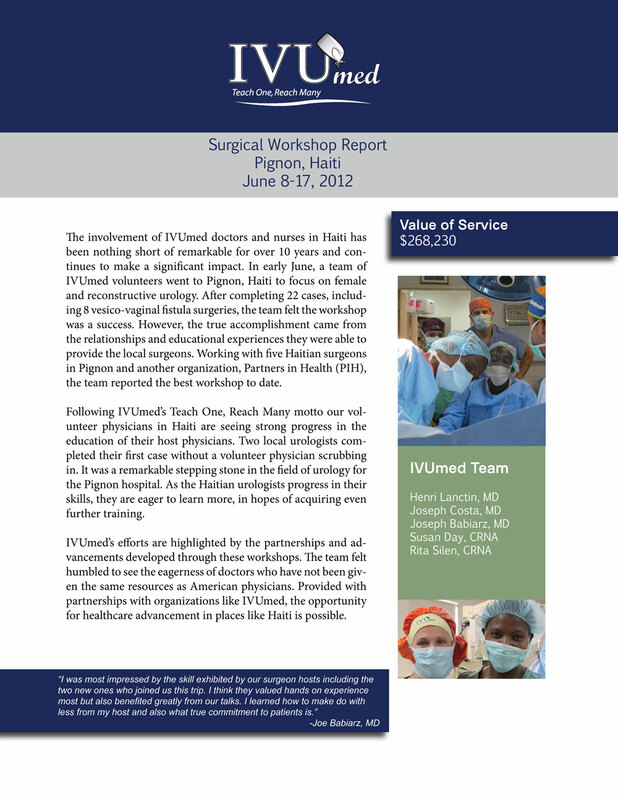 In the coming months, IVUmed is performing two surgical workshops in Haiti, one in Pignon and one in Deschapelles. Both the leaders and many of the volunteers going on these trips have been at least once a year for the past two years. This has given us the opportunity to develop relationships and partner with other organizations, such as Project Haiti and well established hospitals in the region. To hear an informative podcast on the consequences of volunteering, please click here: The Tragic Consequences of Crisis Volunteering, by Amy Costello.